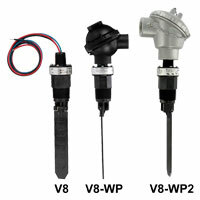 Paddle flow switches or vane sensors with an electrical contact output are at a specific flow rate. 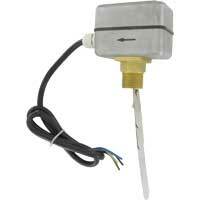 Dwyer flow switches are economical and reliable. Applications include proof of boiler flow, air conditioning, controlling of dampers according to flow, and protecting pumps, motors and other equipment against low or no flow. FLOTECT® Vane Operated Flow Switch is ideal for protecting unattended equipment from damage or loss of production. Applications include air conditioning, food processing, and machine tools. FLOTECT® Vane Operated Flow Switch is reliable and ideal for automatically protecting equipment and pipeline systems against damage from reduction or loss of flow. 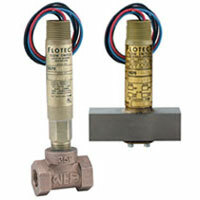 FLOTECT® Mini-Size Flow Switches are compact and designed to monitor liquid, gas, or air flows. The switches control dampers according to flow and shuts down burners when air flow through heating coil fails. FLOTECT® Mini-Size Flow Switch is designed to be inexpensive, reliable monitoring of the presence or absence of flow in a system. Applications include automatically starting auxilary pumps and engines. 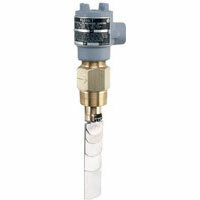 Vane Flow Switch is an economical flow proving solution. Adjustable to fit one to eight inch pipes. Applications include hot water heaters, chillers, machinery, cooling lines, and boiler flow proving. Flotect® Vane Operated Flow Switch is inexpensive for use with compatible liquids to start or stop electronic operated equipment. Applications include proof of boiler flow and protects pumps, motors, and other equipment against low or no flow. What precautions should be taken when making an outdoor installation? Keep the junction box above the nearest low point in the conduit run and make sure the conduit connection is sealed to prevent condensation from running into the switch. Why is the method of mounting a V4 of concern? The vane and magnet keeper assembly near the hinge pin are very close to the mounting threads. Combined with the fact that pipe fittings are available in many variations, this produces a possibility that the customer will mount the switch in a fitting that prevents the vane from swinging. To make things worse, there is usually no way the customer can tell that this has happened. Mounting in a threaded branch connection avoids this clearance problem. How is "deadband" defined as related to the V4 switch? Deadband is the difference between the switch actuation flow and switch deactuation flow; in general, V4 flow switches have a 45% deadband meaning deactuation occurs at approximately 55% of actuation flow. Can a V4 switch be installed in a vertical run of pipe? Yes, but not the standard model. 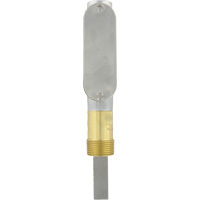 Vertical pipe installations must be specified on the order and require a special spring loaded vane. Only for use in vertical up-flow applications. Please see option -V in online configurator. What precautions should be taken when installing a V4 switch in an extremely high flow application? Installation with a 2 1/2" threaded branch connection is recommended to allow the vane to swing out almost parallel to the flow to reduce stress on the vane and pressure drop in the system.